For some reason Americans can’t wrap their minds around kebabs. First, the bread we typically use is lavash, which is drier than the chewy flatbread used in kebab houses throughout Europe. Oh, we have great flatbread here, but for some reason we don’t marry it with kebabs. And B, we smother everything in hummus and tahini, which I find a little pasty. At Zaytoon, they give every dish a splash of spicy sweet chili sauce and creamy garlic sauce. A Greek gyro is the closest thing I’ve found a Zaytoon kebab in San Francisco–the sliced meat from the spit, the flatbread and tzatziki. Good but not the same. Which reminds me–as summer approaches and we dust off the barbeques–I’ll do a post on my recipe for Greek souvlaki at a later date. 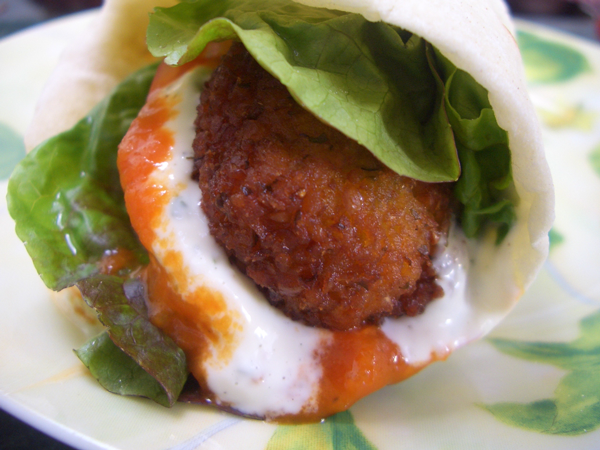 For this recipe I’m using the flatbread, the chili and garlic sauces, but I’m throwing falafel in there instead of meat. 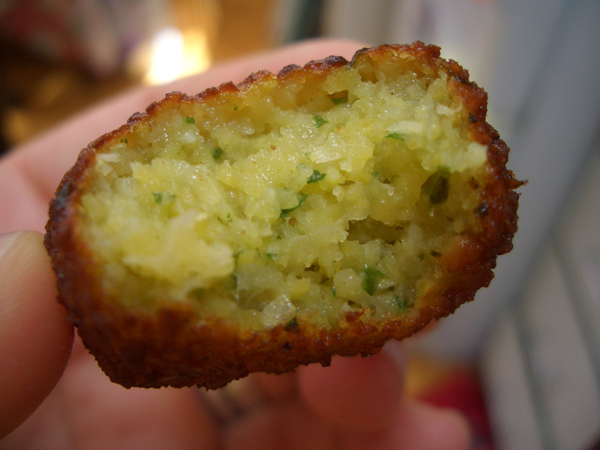 Falafel is another ubiquitous but often awful staple here in mid-east restaurants. Don’t get me wrong, there are some great ones, but there are also a lot of dry, oddly flavored chickpea balls out there. I think this falafel recipe is pretty tasty. My husband–the true carnivore in the house–agrees. For those who’ve noticed I’ve tagged this as “gluten-free” and are staring at that gluten-laden flatbread… We often serve this as sort of a salad or lettuce wrap. 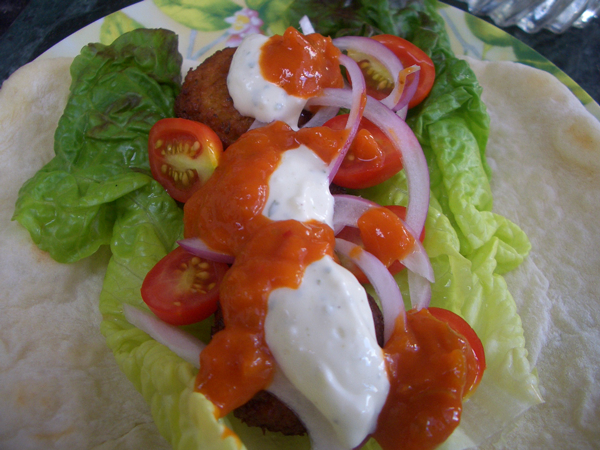 Use large soft lettuce leaves instead of flatbread for the wrap part, or torn lettuce as a bed for everything. 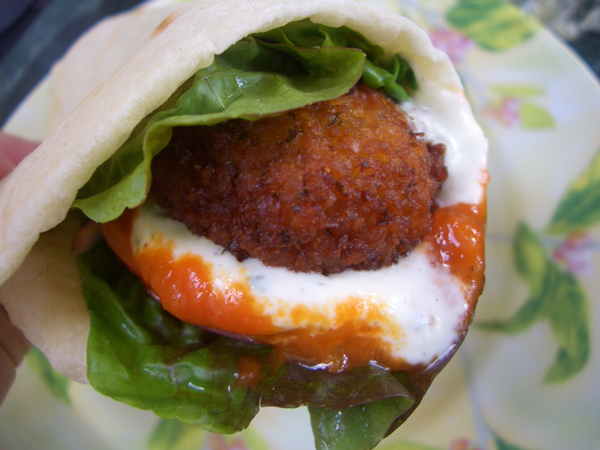 The falafel can easily be made gluten-free (see note), and the sauces are already gluten-free. Note: Substitute 2 tablespoons (30ml) potato starch (not potato flour) for the wheat flour to make these gluten-free. Canola oil, sunflower, safflower, peanut or other good frying oil. You want something with a high smoke point. *When I originally posted this recipe I had a note saying canned garbanzos wouldn’t work. That was what I’d heard–that the falafel would fall apart when you fried them because the canned beans were too moist. Well… one cold and foreboding day, when going to the store seemed like a huge obstacle, and I really felt like falafel, I found myself reaching for the canned goods. And… they worked just fine. I do think dried are best. The texture is better, firmer. And the flavor is better. So I’d say: canned beans = good falafel; dried beans = great falafel. 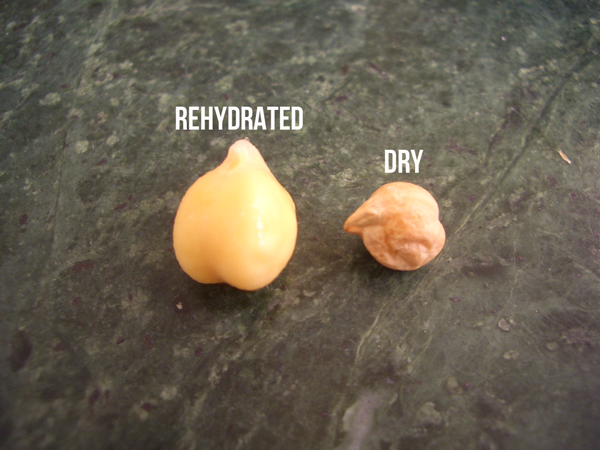 Cover the chickpeas with several inches of cool water and leave at room temperature for 18 to 24 hours. When rehydrated, the beans will measure about 2-1/4 cups (540ml). If using canned beans, drain, rinse and pat them dry. 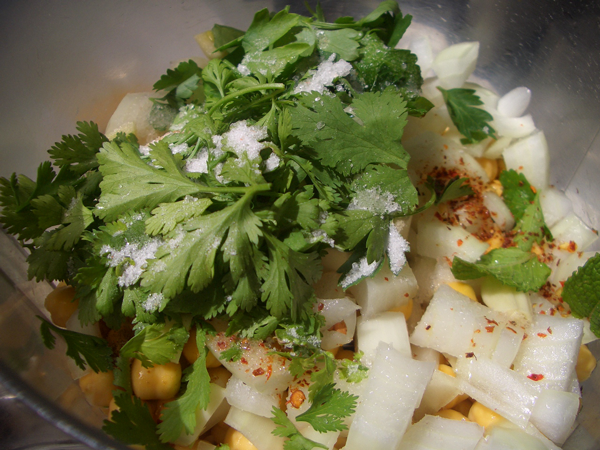 In a food processor, add the chickpeas, onion, parsley, cilantro, lemon juice, pepper flakes, garlic, mint and salt. Pulse until uniformly minced. Sprinkle the baking powder and flour evenly over the mixture, and pulse again until well combined. You want to stop before it becomes a paste. There should be some texture, but no large chunks of chickpeas. Refrigerate for at least two hours, or overnight. The mixture will be a little wet and sticky to handle, but that’s ok. When ready to cook the falafel… In order to save on oil and mess I use a small pan to achieve more height. In the photos you’ll see I was only using about an inch of oil. That was what I had and it worked fine for small falafel. Ideally you want several inches so you don’t run the risk of the balls sticking to the bottom of the pan. And if you’re making larger falafel, you’d definitely want more oil, otherwise the balls won’t have enough coverage to cook on all sides. Have a plate lined with paper towels and a slotted spoon nearby. Bring the oil to 375F/190C degrees over medium-high heat. If you don’t have a thermometer, use a cube of bread to test the temperature. When you add the bread it should start to bubble right away and should brown within 40-60 seconds. Start with one falafel to get the hang of it. 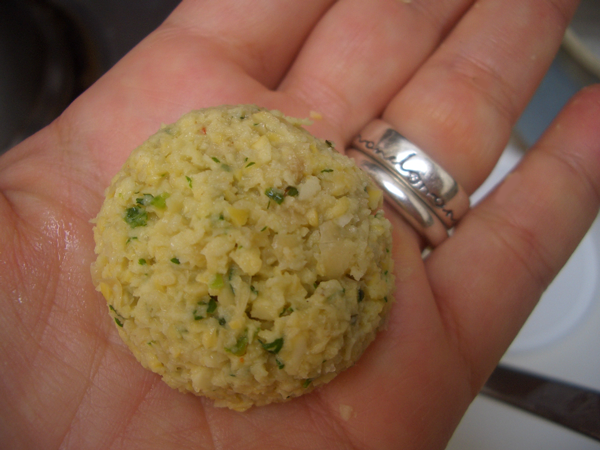 Using about 1 tablespoon per falafel, form the mixture into a small ball and flatten slightly. Drop the ball in the oil. It should foam up and start to turn golden brown. If it turns dark brown right away, the heat is too high. 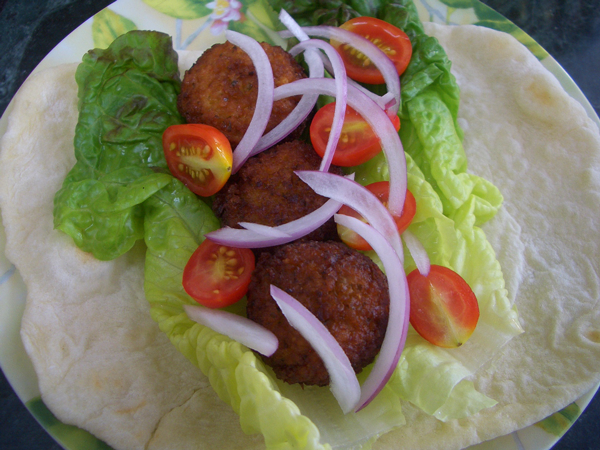 Using a slotted spoon or fork, flip and turn the falafel to make sure they’re evenly brown on all sides. When they’re golden brown all around, they’re done. This won’t take more than a couple of minutes. 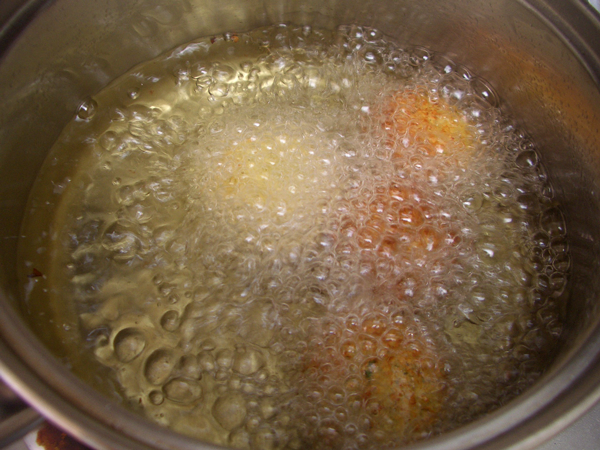 Remove the falafel from the oil using a slotted spoon and transfer to the towel-lined plate. Depending on the size of your pan, cook 4 to 6 at a time. They cook quickly, so you’ll be done in no time even with many batches. Wait a minute or so in between each batch to let the oil come back up to temperature. 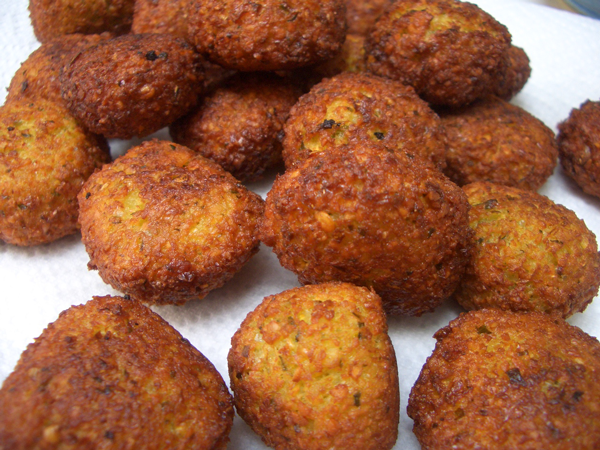 Falafel don’t need to be served piping hot, so it’s OK to let them sit at room temperature. They will stay crispy for some time. If you don’t mind them losing their crispy texture, you can refrigerate them for up to several days and reheat them in the microwave. This recipe makes more than you need for twelve servings, but that’s to leave a little room for error. It might take you one or two tries before you get the bread the way you want it. Combine the flour, yeast and salt in a large bowl. Mix the water and olive oil together and add to the flour mixture. Stir until all of the flour has been incorporated. With floured hands, knead in the bowl, adding addition flour in small increments if the dough is too sticky. You might have to add another 1/4-1/2 cup. It will be a soft slightly sticky dough but it should be workable. Transfer the dough to a floured board and continue to knead for another five minutes or until you have a soft smooth dough. Transfer the dough to a clean, oiled bowl with enough room for the dough to rise to twice its size. Cover the bowl with a damp (not wet) towel and tuck away in a warm corner of the kitchen for about an hour or until the dough has doubled. Punch down the dough and knead in the bowl a bit to get rid of any large air bubbles. Divide the dough into 16 equal portions. Roll each piece into a ball, cover with a towel and let rest for 15 minutes or so. Once rested, on a floured surface using a floured rolling pin or glass, roll out each piece of dough to a 5-6 inch (13-15cm) circle. You might need to do this in stages. Roll one, cook it, roll another, etc. 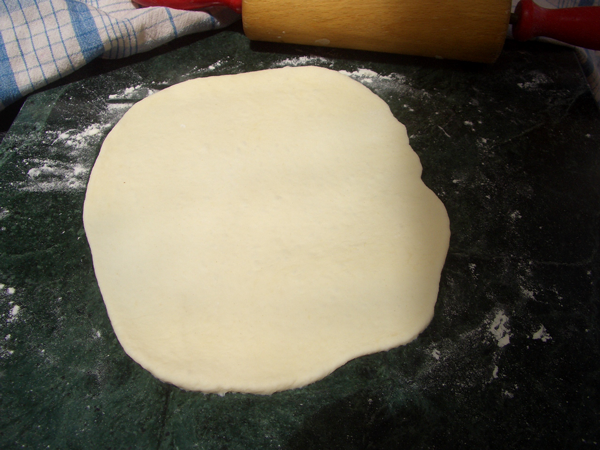 Just keep the unrolled dough covered with a towel to prevent it drying out. 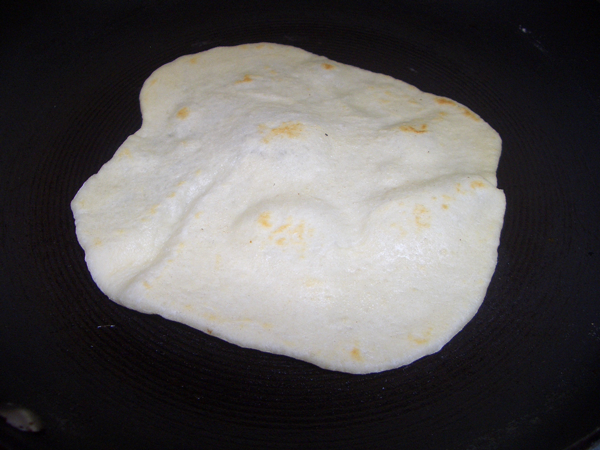 In a large lightly oiled frying pan, over medium high heat, add a circle of dough. Let it cook for several minutes on each side or until you see light brown spots of color. The disk will likely puff in the middle and start releasing steam. The cooked breads can be stacked on top of each other on a plate until you’re ready to assemble the wraps. Combine all ingredients in a food processor or blender and pulse until smooth. Refrigerate until ready to use. 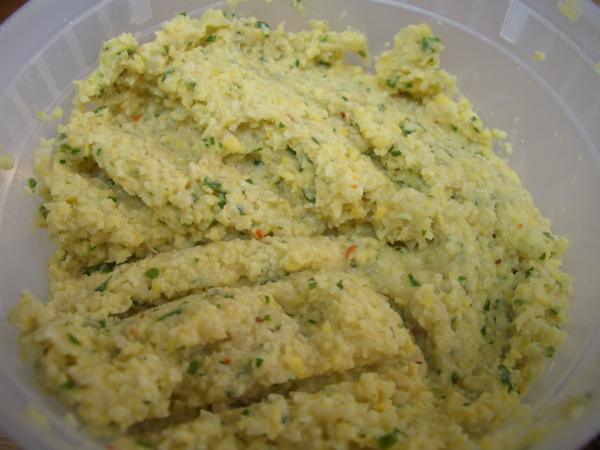 You can cut this recipe in half and you will still have plenty for the falafel, but I’ve noticed people add more of this than the garlic sauce, so that’s the reason for the disparity. 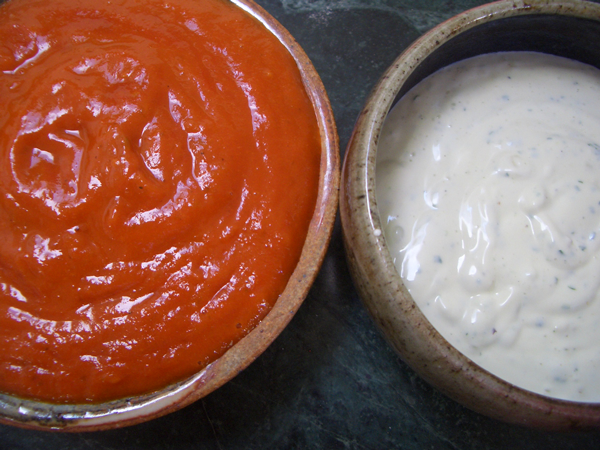 And I like this sauce so much it’s gets thrown on other things in the days following the falafels–eggs, sandwiches, etc. It should keep for at least a week or two in a jar in the fridge. In about 1-2 tablespoons (15-30ml) of olive oil or vegetable oil, over medium heat, saute the onions and bell pepper with a pinch of salt. 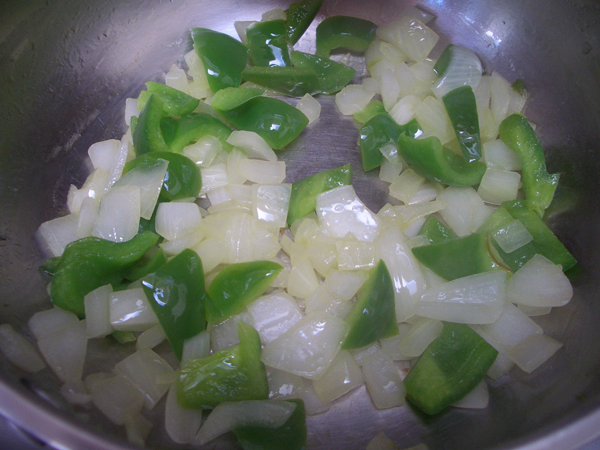 Cook until the onions are translucent, about 5 minutes. 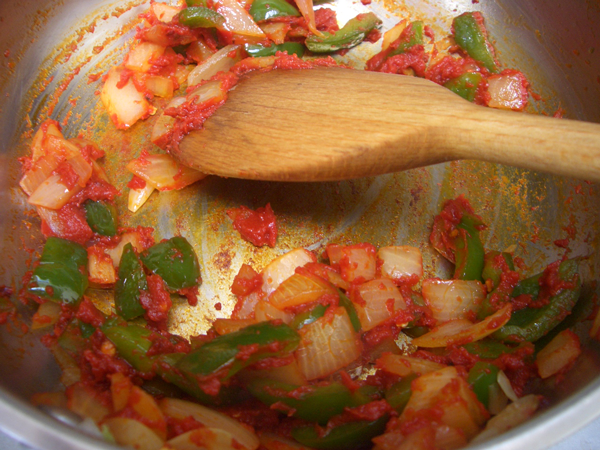 Add the red pepper flakes and cook another minute, stirring frequently. 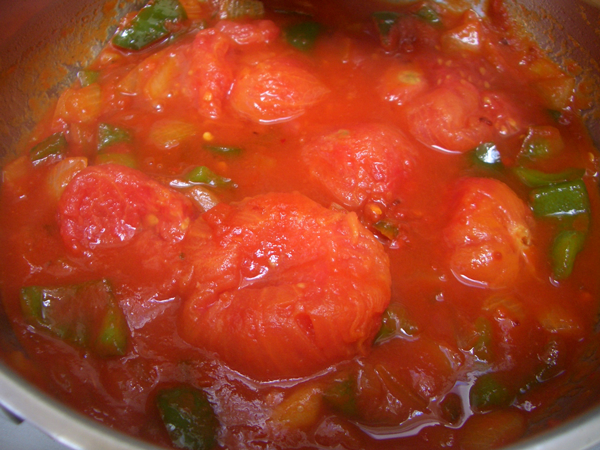 Add the tomato paste and cook another minute, stirring frequently. Add the vinegar and deglaze the pan, scraping all the dark bits off the bottom. Puree the sauce in a blender or food processor and taste. If you like it the way it is, leave it. If you’d like a bit more sweetness, add the sugar. The sauce should be warm enough that the sugar will dissolve in a few minutes. If it’s cooled, add it back to the pan and cook it for a few minutes to make sure. Set aside until ready to assemble the sandwiches. To each flatbread add a layer of lettuce, two or three falafel, chopped fresh tomatoes, sliced onions and top with chili and garlic sauce.